Since the beginning of photography, makers pursued the dream of building cameras that developed pictures in the field. The earliest cameras were based on the laborious "wet" process, which imposed limitations on the photographer. Invention of the dry-ferrotype process in the 1890s changed this. It allowed makers to create a new generation of cameras that allowed photographers unparalleled freedom. The Nodark represents one of the first cameras designed to take advantage of the newly invented dry-ferrotype process. It was a simple box camera that made 2½ x 3½ inch images. Price was $6 (about $122 in year 2000 currency). The Nodark's simple design accommodated twenty-six plates. Its polished wood body design featured two reflex finders, carrying handle, and a nickel plated dial to change ferrotype plates. Nodark Camera, c.1899-? Popular Photograph Company. NY. Nodark fitted with its rarely found developing tank. Fill the developing chamber with liquid No.1, and fix the chamber on slot on bottom of Camera-(see that shutter in chamber is open), pull out slide in bottom of Camera, and plate will drop into the chamber. Push slide in Camera back in place, CLOSE the shutter in chamber and remove chamber from Camera. Slightly shake the chamber, and in thirty-five seconds pour liquid back in bottle No.1, and without opening the chamber, fill it with liquid No.2. This will FIX the picture in from twenty to thirty seconds. The Nodark's interesting history doesn't end here. After acquiring the camera shown on this webpage, and reading the original instruction sheet, I uncovered two historically interesting tidbits. Although this information is minor in the grand scheme of photographic history, it does provide interesting new insights about the camera and its maker. The first new piece of information was discovering that the Nodark was also advertised for use with dry-glass plates. 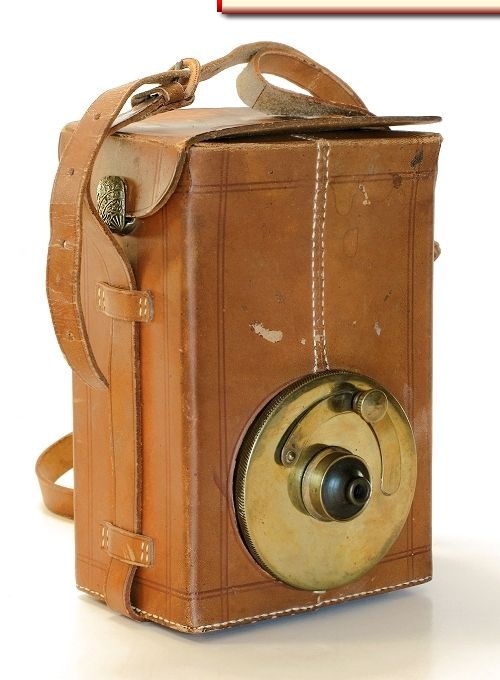 Up until now, the camera was widely regarded exclusive to the dry-ferrotype process. The reverse side of the instruction sheet is dedicated to describing the camera's operation for use with "dry glass plates." According to the directions, each Nodark outfit included a set of "cardboards" that were placed in between each glass plate. This ensured that one plate did not expose the one immediately behind. The instruction sheet also included reference to a company by the name of Merchants Specialty Mf'g. Co., 90 Warren Street, New York, N.Y., instead of the Popular Photograph Co. (the generally accepted maker). In contrast, owner's manuals (as opposed to single instruction sheets) and advertising listed the Popular Photograph Company as the maker. Note: Cosaque is the name of a French made magazine camera. That's it! After admiring the image, the photographer could shoot a new picture by turning the nickel-plated dial on the side of the camera to position a fresh plate. Because the entire exposure and development process was performed without a darkroom, the "Nodark" moniker (No Dark) represented more than just a name. 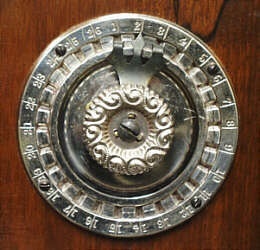 Detail of the ornate plate changing mechanism. of plates loaded in the camera's wood magazine. Because the entire exposure and development process was performed without a darkroom, the "Nodark" moniker (No Dark) represented more than just a name. "Cosaque" and "No Dark" are two trade names which, on the action of Kodak, Ltd., have been withdrawn by the users, the Court ruling that their resemblance to "Kodak" constituted an infringement of the rights of Kodak, Ltd., in the use of this word. A side-by-side company comparison (left), although inconclusive as to which is the Nodark's actual maker, allows us to draw some inferences. For example, we can conclude that the "Merchants" address appearing on instruction sheets could not date any earlier than 1903. Additionally, "Popular's" last listing is 1901 - 1902 while "Merchant's" first Warren Street listing is 1903. Coincidence? To speculate momentarily, there could have been a business relationship between the two companies - "Merchants" fabricating nickel-plated parts for the Nodark and possibly assembling the actual camera - implying that the Popular Photograph Company was the original maker. Pushing the speculation envelope even further, "Popular" may have encountered financial difficulties and sold all Nodark rights and inventory to "Merchants." "Merchants" may have attempted to continue marketing the camera, failed, and closed out the remaining inventory or simply went bankrupt after 1905. A similar business arrangement occurred later in 1908 when the Multiscope & Film Company sold all of its Al Vista rights, patents, and equipment to the Conley Camera Company. Any further information (such as company documents and inventory records) would be appreciated.